Ironically, at the same time that Iranian protesters are invoking comparisons to Islamic State militants in their demonstrations against the series of acid attacks that have severely injured women apparently deemed to be improperly attired, one prominent supporter of the clerical regime has drawn the same comparison between the Islamic State and pro-democracy activists. Ghasemi went on to assert that a culture associated with Islamic militants is causing young Iranians to “distance themselves from [Iranian] principles,” which have their foundation in the 1979 Islamic Revolution. 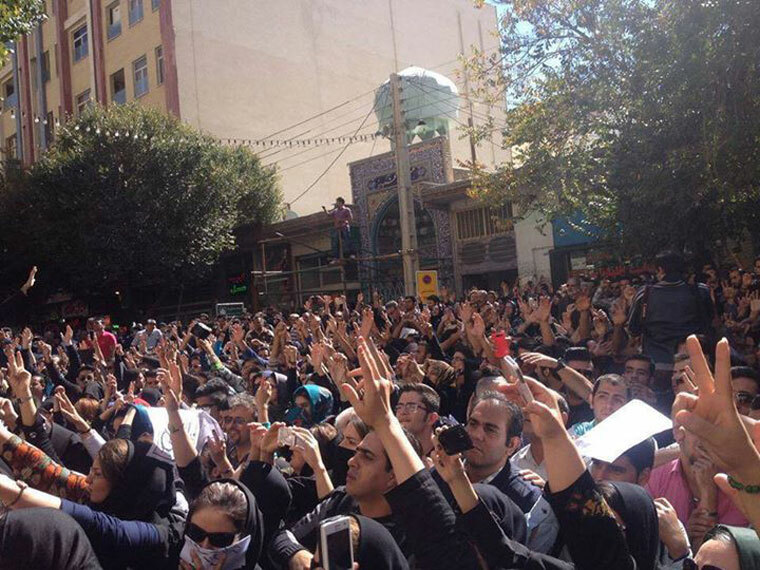 The young people whom Ghasemi refers to are generally regarded by analysts as being highly educated and pro-Western, and the 2009 protest was recognizably a pro-democratic movement. Other comments by supporters of the Iranian regime indicate that ironic comparisons between IS and pro-Western, pro-democracy activism are completely intentional. Radio Free Europe points out that in August, conservative cleric Alireza Panahian specifically equated the threat of Westernization to the threat posed by the Islamic State. Of course, many of those who are not representatives of the Iranian government agree with the sentiment of protesters who this week compared the Iranian regime’s enablement of Islamist militias to the Islamic State’s brutal enforcement of its concept of Islamic law. But beyond the issue of such domestic tactics as attacking “badly veiled” women, many commentators make direct comparisons between IS and Iran in terms of their organization, their threat to global security, and their use of terrorism beyond their own boundaries. For instance, Newsmax on Thursday quoted Rachel Ehrenfeld, the director of the American Center for Democracy, as describing Iran as a “strategic brain for terrorist activities” throughout the world. She also called Iran the principal agitator and a major state sponsor of terrorism, effectively reiterating a judgment made year after year by the US State Department. In light of this focus on the Iranian threat to global stability, Ehrenfeld criticized the Obama administration’s soft approach to dealing with the Islamic Republic. She went so far as to say that Obama has effectively reversed a decades-long policy of not-negotiating with terrorists, such that all of his actions in the Middle East have benefited Iran. Conservative blog PowerLine agrees with Younesi’s assessment that Obama and democrats in general are no threat to the Islamic Republic. The blog also agrees that conservatives are intent on portraying Iran as a greater regional threat than IS, but it adds that this appears to be the reality of the situation, owing in part to Iran’s nuclear program. Younesi’s perception of Obama as weak is presumably not unique amidst the halls of Iranian power, and it may help to explain the aggressive positions that Iran has consistently taken during negotiations with the US over Iran’s nuclear program, as well as in discussions of the two nation’s mutual fight against the Islamic State. That aggression has taken the form of insistence on no cuts to Iranian enrichment capabilities and the demand that the US suspend economic sanctions in order to secure help from Iran in the IS conflict. The Diplomat reports that Rear Admiral Habibollah Sayyari, the commander of the Iranian navy, made his first ever visit to China, a nation that is developing ever closer military and trade relations with Iran. During the visit, the Chinese defense minister and naval commander reportedly each expressed interest in further such development, especially with respect to the two country’s navies. The Diplomat cautions that this Iran-China friendship could further decrease US leverage in nuclear talks, providing Iran with trade and defense alternatives in the event that no agreement is reached. Furthermore, it is possible that China, which is part of the P5+1 group negotiating with Iran, might push for that outcome, recognizing that worse Iran-US relations will make it easier for China to gain a foothold in Iran, and thus in the Persian Gulf.